Placer County Sheriff Bell Recognizes Two! 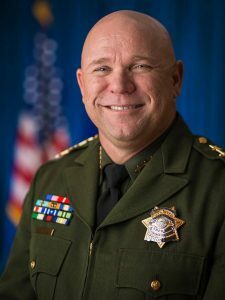 Home » News » Local News » Placer County Sheriff Bell Recognizes Two! By BStigers on February 13, 2019. Placer County Sheriff Devon Bell presented two persons the “Citizen’s Medal of Merit”, at a ceremony at Sheriff Headquarters yesterday at Dewitt center in North Auburn. 8-year old Isabel Pierce assisted her gunshot wounded father on Jan 15th on Rock Springs Road in South Placer County when he was shot in the chest during a shooting spree by a 48-year-old Montana man. Isabell alerted her dad he was bleeding, then applied pressure and held a sweatband while he drove to a Loomis Fire Station where he received medical attention. The other award was to 8-year Army Vet, 26 year old Tyler Metildi, a Best Buy Employee who tackled a burglary suspect outside the Roseville Best Buy Store after the suspect punched a sheriff deputy in the face and was running away in the parking lot. Metildi held Timothy Trujillo of Reno, NV, down on the surface until deputies arrived, handcuffed him and arrested him. Metildi was fired from Best buy for violation of company policy but after outcry from citizens, they reconsidered and offered to re-hire him, which he said Monday he has refused and wants to become a Placer County Detective. He is set to take the written test at the end of the month and hopes to enter the academy. The Citizen’s award was established in 2006 and has only been awarded 6 time prior to yesterday.